A day at the beach can be all fun and games, until somebody gets hurt. I know, it sounds like something your mother and your mother's mother said, but it does ring true. Fortunately, there are some things you can do to prevent accidents and safe guard against injuries, drowning and more while enjoying the sun, water and ocean breeze with the kids. 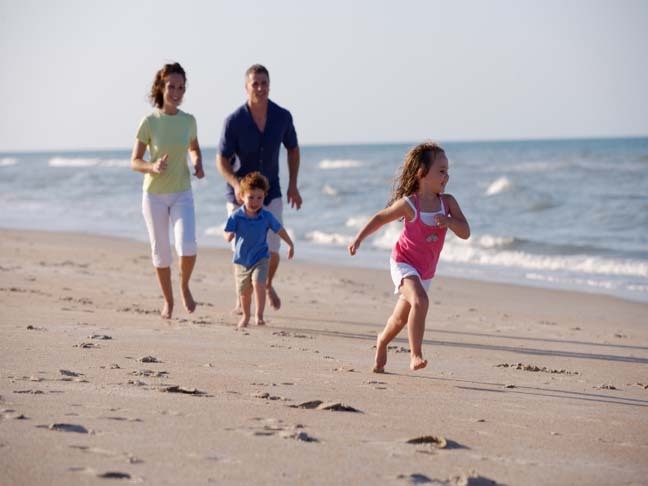 When selecting a beach, opt for a family friendly one. Choose a beach that is known for its gentle surf and soft sand. You'll also want to swim at beaches that have life guards on duty. Uou'll want to always pay attention to any warning signs or flags. Signs and flags may warn of harsh currents, shark sightings, sharp coral, jelly fish or other dangers. It's vital to beware of a false sense of security. Absolutely nothing including life guards, life vests and floatation devises, is a replacement for constant and vigilant supervision. Don't let your kids in the ocean alone or expect the life guards to monitor your kids activity. Be sure to bring along loads of sunscreen. It takes about an ounce of sunscreen to properly coat a young adult. That's equal to about a shot glass full! Be sure to reapply after swimming or sweating and consider putting your kids in swim suits and shirts that have a high UPF rating and wide brim hats for added protection. You'll also want to have lots of water handy to fend of dehydration. Invest in swim shoes for the kids. Swim shoes can protect your child's feet from the sun, but more importantly can protect his feet if he steps on sharp shells or sea creatures. Ingrain beach safety rules in your kids. Teach them to never turn their back to the ocean, to swim parallel the beach if caught in a rip current and to always obey the lifeguard and posted flags and signs. Perhaps most importantly, set an example. Teach your children proper beach safety and etiquette by following rules and treating others with respect. What's your trick to ensuring a fun and safe day at the beach? Share your thoughts in the comments section below.